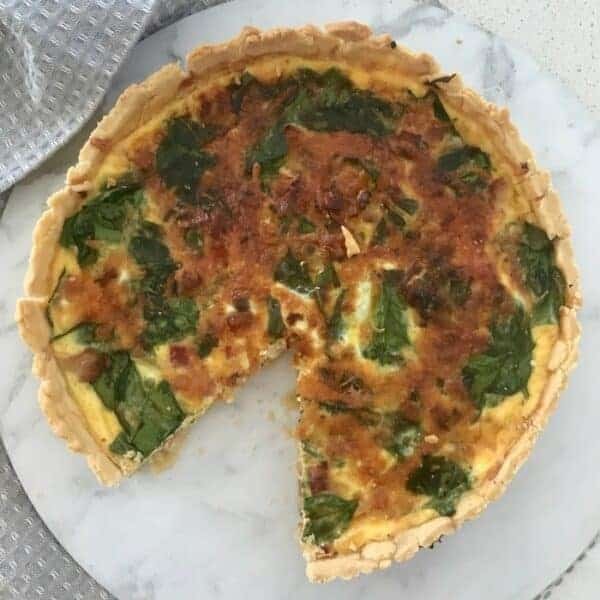 When I had some leftover baby spinach leaves recently, I just knew I needed to turn them into this Thermomix Spinach Bacon and Cheese Quiche! 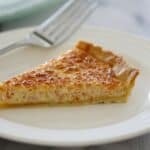 To say I’m a bit in love with this quiche recipe is an understatement, it combines three of my favourite ingredients into one delicious meal, it’s simple to prepare (yes, pastry really isn’t that scary to make – I promise!) 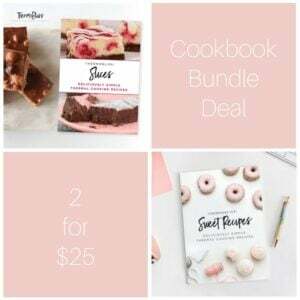 and it’s also freezer friendly, which means I’ve got an easy meal ready to go at any time. 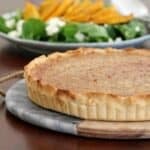 This recipe is basically our Thermomix Vegetable Quiche recipe with a different filling as it’s such a great versatile recipe to start with. 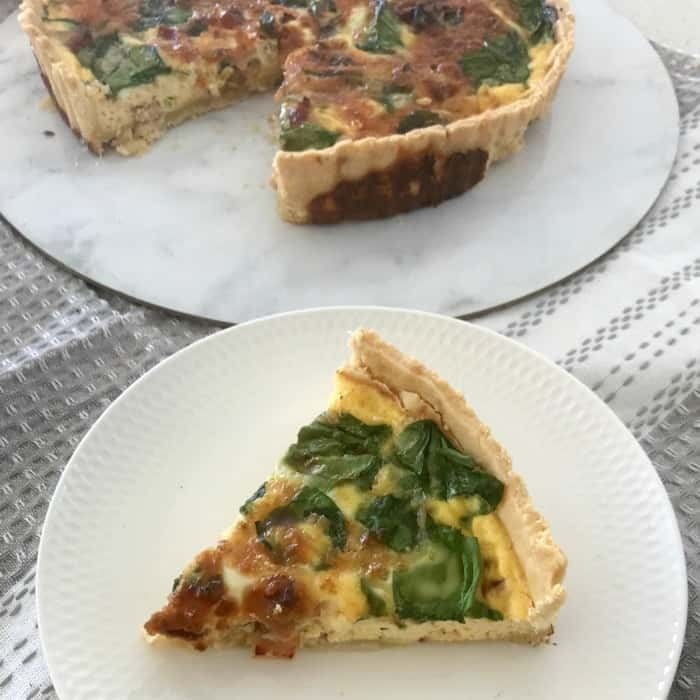 I’ve been eating this quiche on it’s own with some homemade tomato relish on top, however you can bulk it up and turn it into a complete meal by serving it with roasted/steamed veggies or even with rice or pasta too. 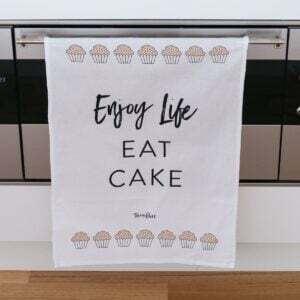 For more family friendly Thermomix Dinner Recipes, check out this post. Place the plain flour, butter and water into your Thermomix bowl and mix for 6 seconds on speed 6. Scrape down the sides of the bowl and using the kneading (interval) function, mix for 3 minutes. Turn the mixture out onto a bench dusted with flour or a Thermomat and bring together into a smooth ball. If the mixture is a little too crumbly, add an extra tablespoon of water. Wrap the dough in cling wrap and place into the fridge for 30 minutes to chill - preheat your oven to 190 degrees fan forced. Place the parmesan and tasty cheese into a clean Thermomix bowl and mix for 8 seconds, speed 8 to grate. Set aside until needed. After 30 minutes, remove the dough from the fridge and sit on our bench to allow it to slightly warm. In the meantime, place the onion and garlic cloves into your Thermomix bowl and mix for 5 seconds on speed 6 to grate. Lightly dust a rolling pin and bench (or use a Thermomat) with flour and roll the pastry out until it's approximately 3 - 4mm thick - use your pie tin (I used a 22cm one) as a guide to how big your pasty needs to be, you want to allow a 3cm border of pastry around your dish for the sides. Carefully place your pasty into your pie dish and gently press the pastry against the edges. Trim off any excess, but do leave approximately 1/2 cm of pastry hanging over the tin as it will shrink. Place a sheet of baking paper on top of the pasty and top with baking weights or rice. Cook for 14 minutes before removing the baking paper and weights and cook for a further 6 minutes. To make the quiche filling, add the short cut bacon (which has been roughly torn into pieces) to your Thermomix bowl (which still has the chopped onion and garlic in it and mix for 5 seconds, speed 5 to dice. Scrape down the sides of the bowl and add the olive oil and cook for 3 minutes, 100 degrees, speed 2. Add the grated parmesan and tasty cheeses, milk, eggs and salt and pepper and mix for 10 seconds, speed 2 on REVERSE to combine. Sprinkle the baby spinach leaves over the baked pastry shell and pour the filling over the top before baking in your 190 degree preheated oven for 35 minutes or until it's golden on top and cooked through when tested with a skewer. Have you got your copy of ‘A Month of Thermomix Dinners‘ yet? 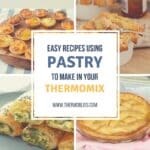 You can shop the full range of Thermomix print and eBooks here. cheese bacon and spinach what is not to love !